This section describes the technology of DMA copy of kernel on startup. It's necessary to copy binary images, such as a kernel image, file system images, and so on, from ROM to RAM on bootup if XIP isn't used. 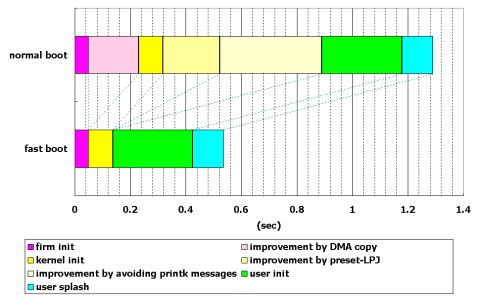 In this case, using DMA transfer is very efficient to save the time and CPU resources. It owes much to the potentiality of FR-V processor, but it's worthy of consideration to use such a hardware assist feature for reducing bootup time. This page was last edited on 15 November 2008, at 09:27.